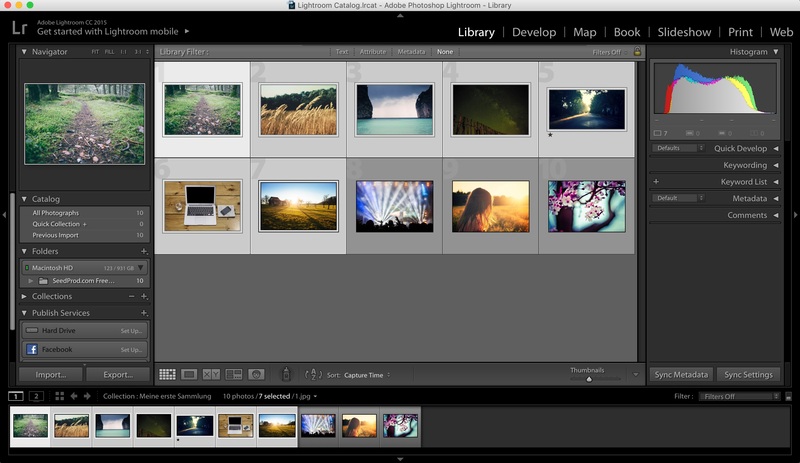 Since Apple dismissed it’s fabulous photo software Aperture, I started to look into Adobe’s alternative: Lightroom. I really like the photo editing capabilities and features of Lightroom a lot and I’m an avid fan of the software. Compared to our Photoshop watermarking tutorial a few weeks ago, Lightroom has a “real” built-in feature to watermark photos. 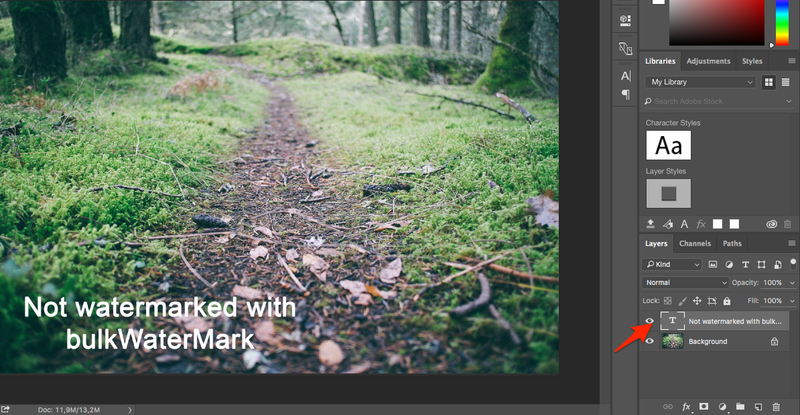 In this article I would like to look into the photo watermarking functions of Lightroom and how they perform in contrast to bulkWaterMark or waterMark V2. First of all, Lightroom does a very basic batch watermarking job compared to bulkWaterMark, but the integration in your photo editing workflow is a big plus here. 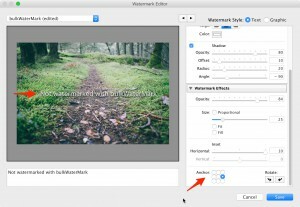 As in bulkWaterMark or waterMark V2, Lightroom does also allow image and text watermarks for protecting your pictures. I’m using the latest version Adobe Lightroom CC 2015 in this tutorial on a Mac, but as usual: This should also work for older versions, since to watermark photos is not a new feature anymore. Also: Windows shortcuts and menu titles are the same as on the Mac, unless stated otherwise. 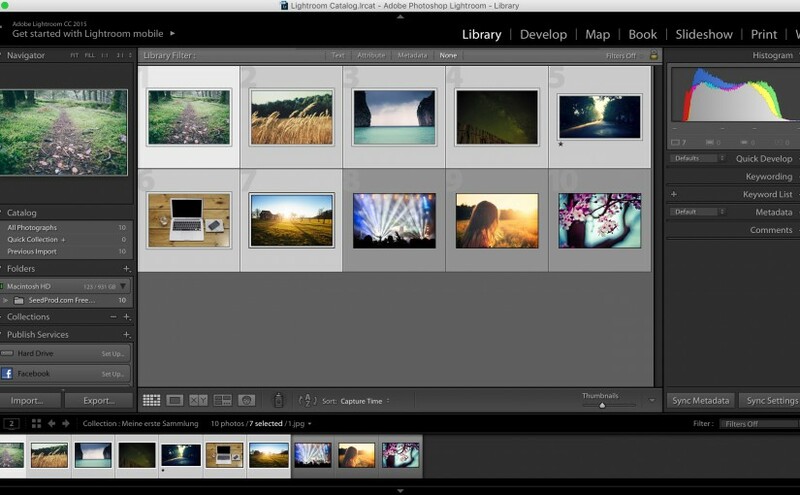 In Lightroom, you can watermark photos when exporting your photos. Therefore, I suggest selecting a few images in our library that we want to export and clicking the “File/Export…” menu entry. Now it’s getting interesting: Like the profile editor of bulkWaterMark, Lightroom opens a window called “Watermark Editor” that allows you to design your watermark. 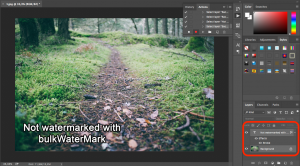 Lightroom’s Watermark Editor also has rudimental live editing features to change the size of your watermarks by dragging a text watermark’s edge, whereat bulkWaterMark features more detailed watermark composition possibilities comparable to the Adobe flagship product Photoshop. 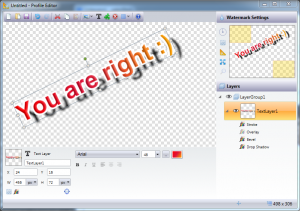 The editor is split into multiple areas: Most of the dialog is filled with a preview canvas that displays one of your selected export pictures topped up with the watermark. 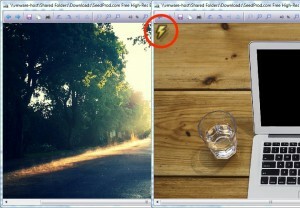 The arrow buttons on the right top of the dialog let you browse through the photos to export and watermark. Step 5: Mixed mode or pure graphic watermark? Next to the arrows you can set your watermark style with two radio buttons. Lightroom supports either a text watermark with an optional image watermark or a pure image watermark. If you select “Graphic” then you have to define an image file for watermarking. And if you choose “Text” then you can define an image file for watermarking. So the only thing these radio buttons are doing, is enabling or limiting some of the available watermark options. Right below the style radio buttons you will find the settings of your custom watermark grouped in multiple sections. As mentioned above, depending on what style you are choosing, you can either edit all watermark options (selection “Text”) or just “Image Options” and “Watermark Effects” (selection “Graphic”). You can also set an anchor for the watermark to position it, but you are limited to a single selection. Also a tile mode is missing that allows you to distribute your watermark over the complete photo. Step 8: Ahoy! Setting an anchor! If you are satisfied with your settings, you can close the dialog by clicking the Save button. Lightroom asks you for a preset name and after entering it you are back on the export dialog where the Export button awaits your final click to watermark photos. So you have seen that watermarking in Lightroom works out pretty well. The configuration of the watermark is not always smooth, but on the whole very handy. It is integrated nicely in the export workflow of the application and also delivers good results. 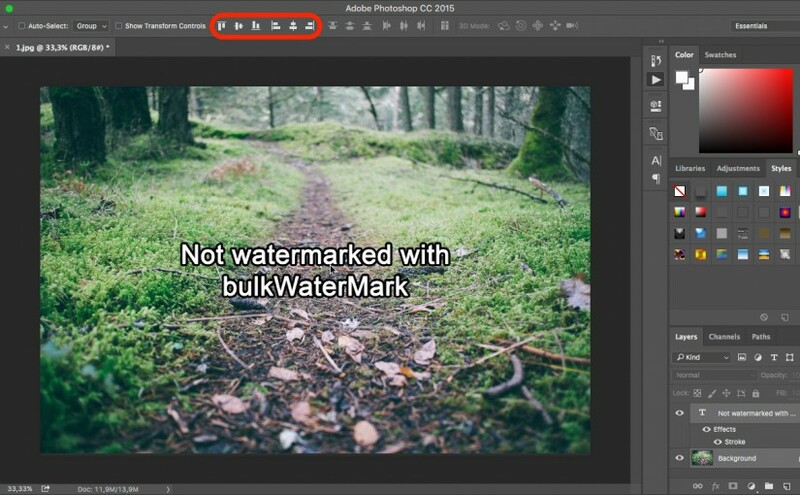 In comparison to our Photoshop tutorial the steps to create and setup our watermark are less complex and Lightroom is way faster in applying the watermarks on your pictures. When comparing side by side with bulkWaterMark, Lightroom lacks of many key features that bulkWaterMark supports out of the box. Lightroom does not support variables within a text watermark to display Exif information for example. Also the positioning of the watermark is not as flexible as in bulkWaterMark where you can set multiple anchors and tile watermarks. 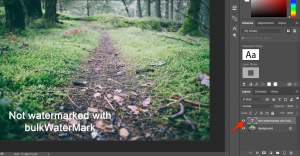 In Lightroom you can use the drop shadow effect only on text watermarks, whereat bulkWaterMark allows you to use drop shadows on image or text watermarks and supports even more Photoshop-esque blending effects like glow, bevel, stroke or mirroring. I hope my tutorial was helpful to you! 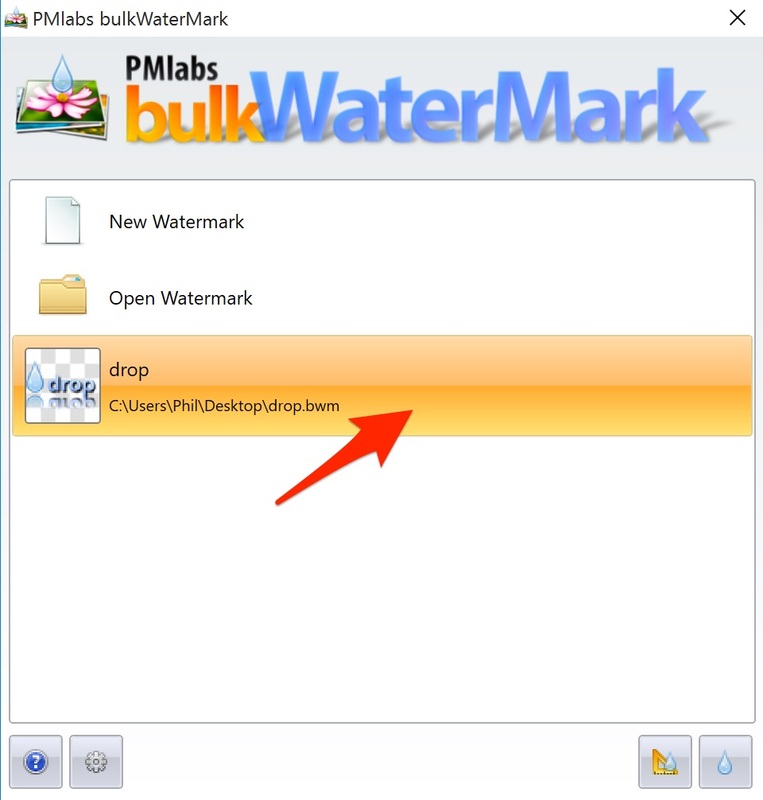 You are using PMlabs waterMark V2 already, so why should you switch to the brand new and commercial PMlabs bulkWaterMark? We thought a lot about how to improve the user experience of waterMark V2. Like V1, the V2 had a similar interface for configuring the batch watermarking. 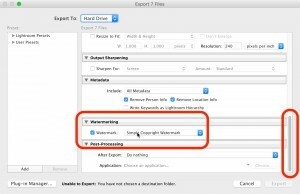 Opening or defining the watermark and its position, setting an output format and folder, adding files to the batch run and finally hit the button to start watermarking your photos. Simple, but somehow not really self-explanatory. I have often heard that people were overwhelmed when seeing waterMark V2 the first time in all its glory. For me as developer of the software, the workflow was clear, but for users not. 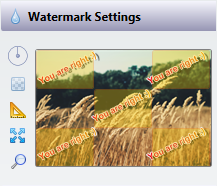 Therefore, we redesigned the UI mechanics of bulkWaterMark for configuring the batch watermarking of photos. 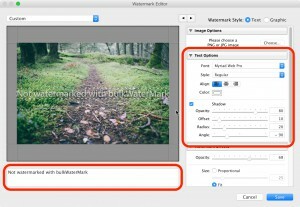 bulkWaterMark welcomes you with a start view that lists all recently used watermarks. 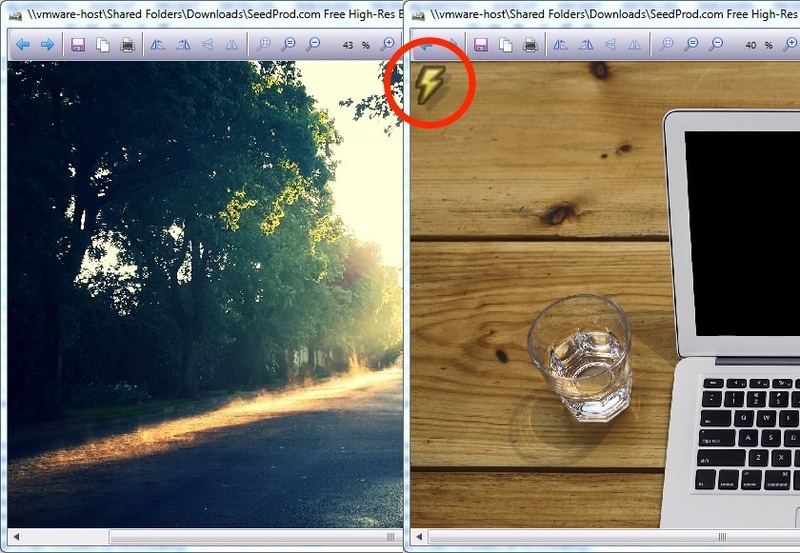 To use one of these watermarks to batch watermarking your photos, just double-click them. If you want to create a new watermark, double-click the first entry and the profile editor opens. 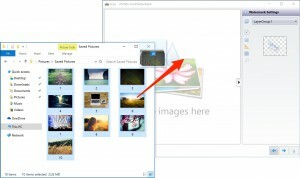 By double-clicking the second entry of the list, you can open a watermark that is not in your list yet or has been saved on a different computer. Afterwards the photo batch list view awaits your pictures to be dragged into the list. 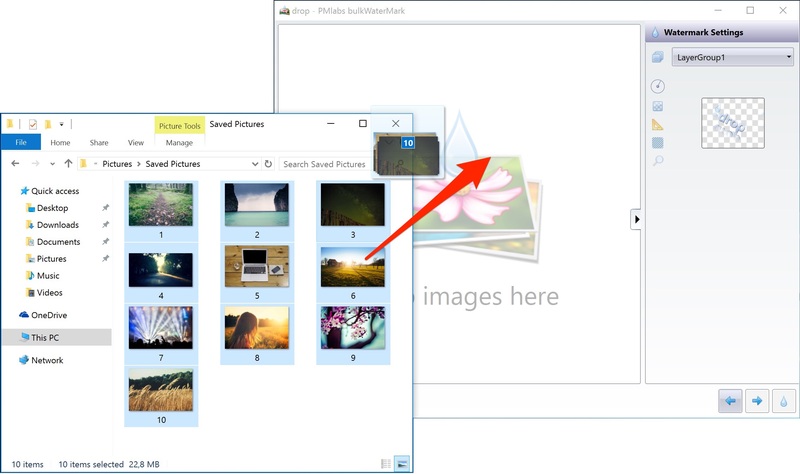 Just drag the image files or folders you would like to get watermarked from the Windows Explorer and drop them onto bulkWaterMark’s batch list. 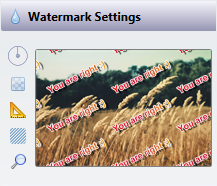 As soon as bulkWaterMark has some files to play with, you can check if the watermark looks good on the images without modifying the original files. Simply click a photo to get a preview. 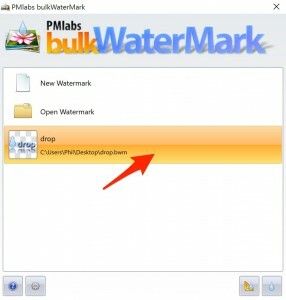 If everything is looking alright, then start the fast bulk watermarking by clicking the drop button. The app asks you politely where to save the protected files and tries to match the output file format with the input file type. Otherwise you can follow the wizard to change output settings like target folder, resizing, renaming and image format converting. 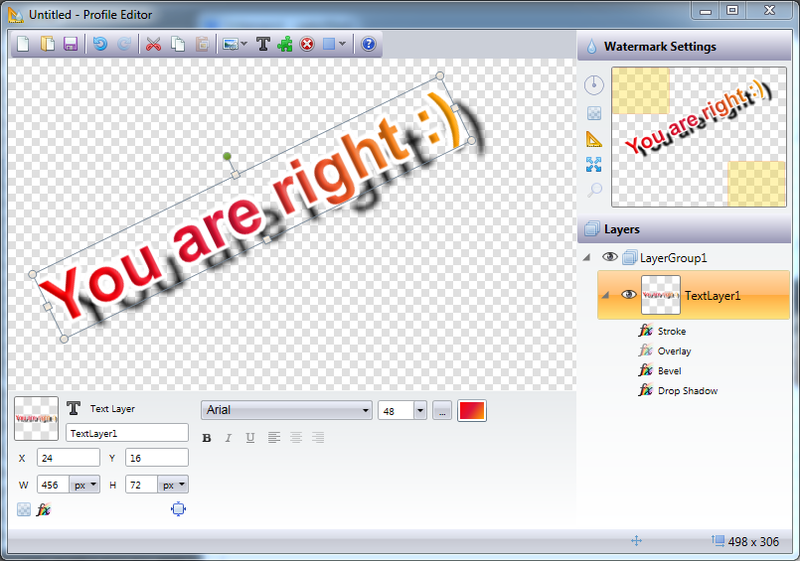 While waterMark V2 already allowed to create watermarks in WYSIWYG (What You See Is What You Get) style with layers like Photoshop, its profile editor had some limitations. Some examples: Layer rotation was not possible in V2 and if you wanted to add a new text watermark to your images, a new window appeared where you can edit the layer’s display text. 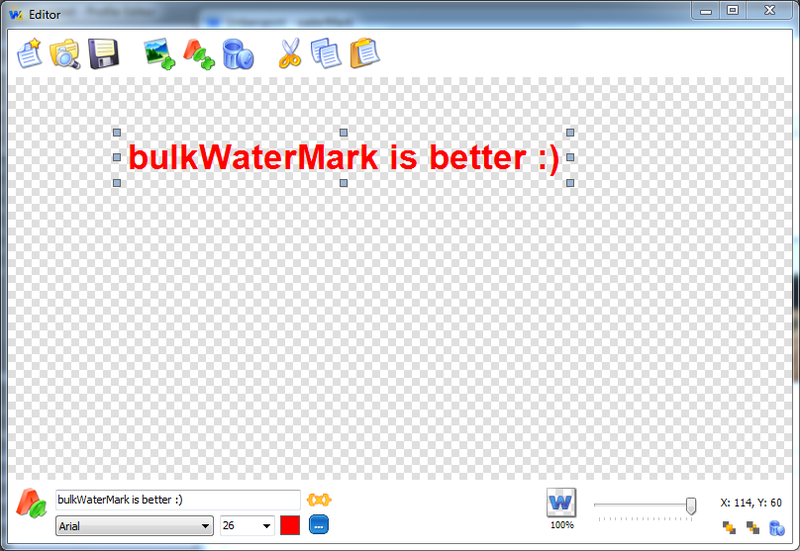 In bulkWaterMark you can now type directly your text layers and rotate or resize them via mouse. If you are accidentally deleting a layer, bulkWaterMark will fix that by offering you an undo of the fatal action. 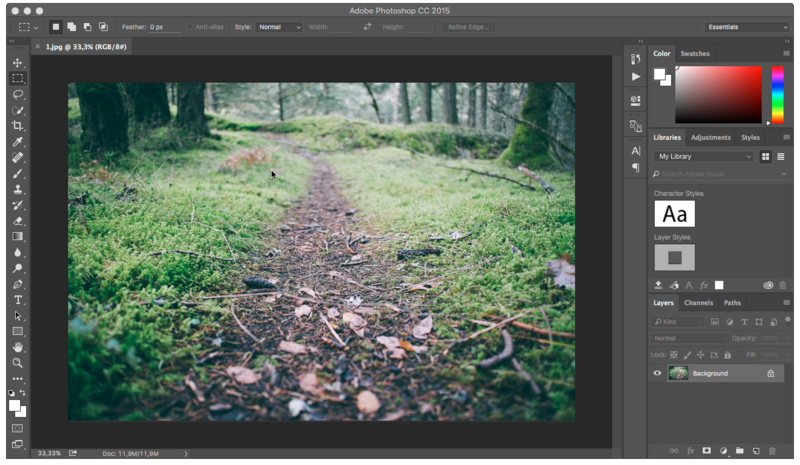 This and a lot of other features can now be controlled more smooth and natural as you would expect it from an image editing software. Tiny tweaks like previews of each available font (you can set for your text watermark when selecting the font family) are making the user experience perfect. Besides these UI improvements, there are also a ton of real new watermarking-relevant features that can be enabled within the new profile editor. 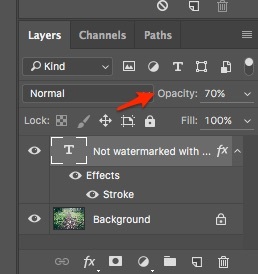 The bulkWaterMark screenshot above shows some of the new features: For example, you can see the new gradient color brush that is available for all layer color selections in your watermark. In the watermark above I used the colors red, crimson and gold to compose the gradient. 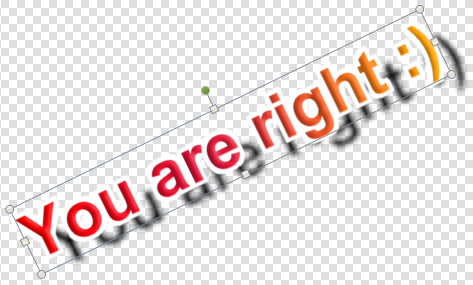 Also, the text layer of the watermark is rotated – a new feature for layers and layer groups in bulkWaterMark. Wait, layer groups? Yep, that’s also new. Layer groups are surprisingly a group of layers and stand for a watermark. So you now can apply multiple watermarks on a photo by defining multiple layer groups in bulkWaterMark’s watermark editor. Another one: Blending effects. You can now have a soft drop shadow below your text or a thick stroke that surrounds each character. These effects can be combined and used for any type of layers, like image watermarks too. Also neat: Live preview your watermark while editing it. Just drag and drop an image file onto the preview of the profile editor and the picture gets previewed with the watermarks that are on your canvas. bulkWaterMark is extendible by using PlugIns. In the next few month we will ship free PlugIns to provide more options for creating new watermarks, developing your own custom expressions for text watermarks or including new image formats for import and export. 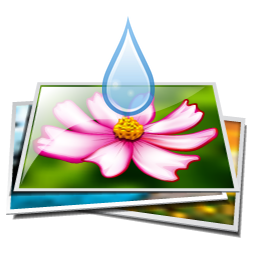 A social export PlugIn is also in the pipeline to support watermarked image upload for Facebook, Flickr and WordPress. We will also release our PlugIn SDK as mentioned a few weeks ago. In the meantime we are fine tuning and optimizing all the interfaces and setting up the documentation. For bulkWaterMark we also did some fine tuning regarding resizing and renaming options. 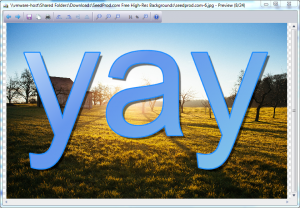 For resizing we added the possibility to set the resolution of the file in dpi and also implemented two flags to avoid enlarging smaller images or shrink bigger images. This is useful if you have a lot of high resolution photos in your batch list that need to be sized down to 800 x 600 pixels, mixed with some small pictures that are only at 640 x 600 for example. bulkWaterMark will watermark the small pictures too then, but will not resize them to 800 x 600 pixels, because the original size is smaller. 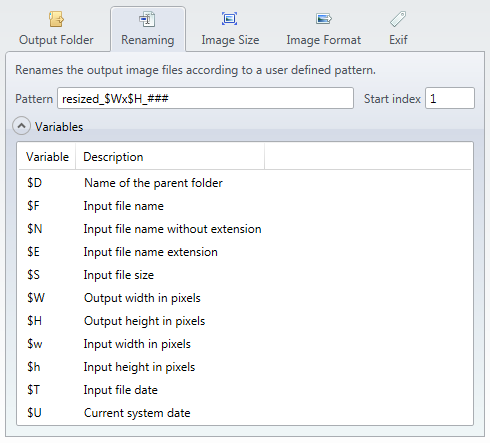 In the screenshot above I am defining the renaming pattern “resized_$Wx$H_###”. When using typical photo taken by a digital camera or smartphone, the filename is probably something like “DSC_1232.jpg”. If this is the fifth image in your batch list and the image is 2500 x 1667 pixels, then this will result in the output filename “resized_2500x1667_005.jpg”. 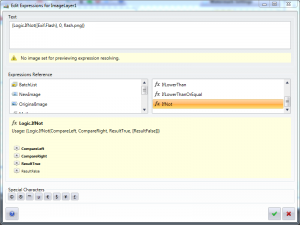 Expression features are fully available in every version of bulkWaterMark, including PlugIn support. 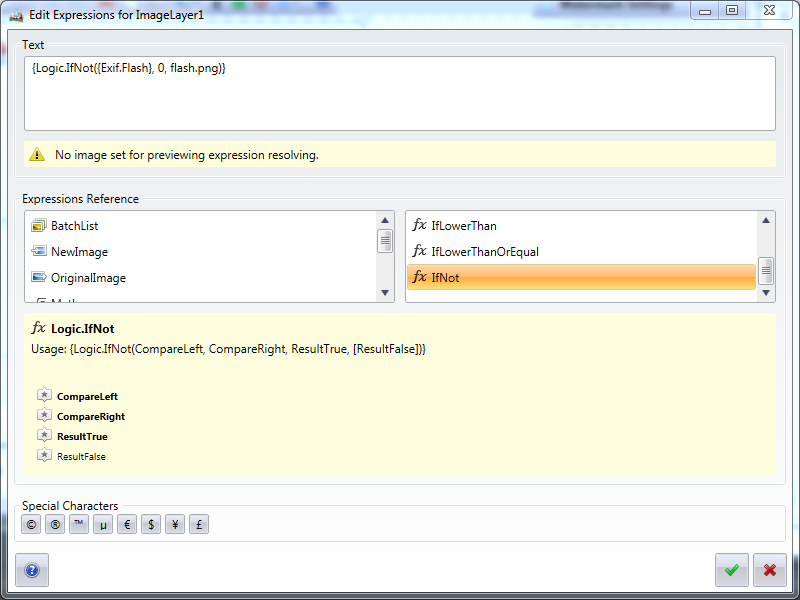 More in-depth details on the topic expressions will follow in the next few weeks in our blog! So you have seen that bulkWaterMark does indeed rock more than waterMark V2. It’s a lot more, also compared to paid alternatives. 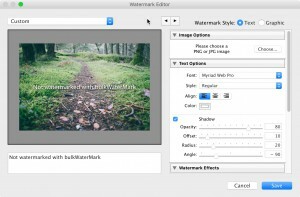 We hope you are enjoying the new features and tools that are packed with bulkWaterMark for protecting your photos with watermarks. Please keep in mind, that we still have a lot of ideas for future releases and PlugIns for 2016. 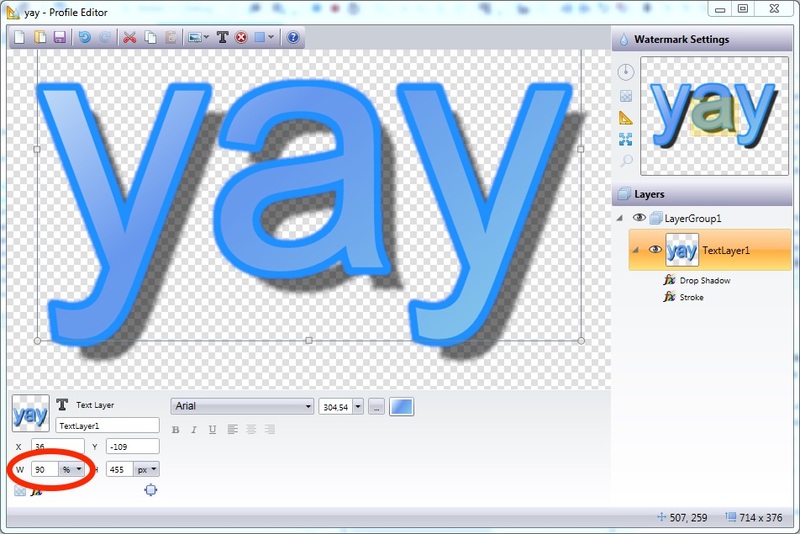 Stay tuned and watch out for a more detailed write-up about our new dynamic expressions in bulkWaterMark! There are many ways of adding watermarks to your images. So why should you use PMlabs bulkWaterMark or other similar batch photo tools instead of the free Gimp or the industry standard Photoshop? 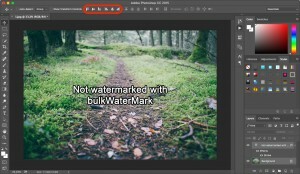 Even professional photo tools like Adobe Lightroom do watermarking, but in a very basic way compared to bulkWaterMark. The following series in our blog covers different approaches on how to watermark photos and shows you the pros and cons of several software solutions. Our first test candidate is Adobe Photoshop. Photoshop is the world’s most popular and powerful image editor. 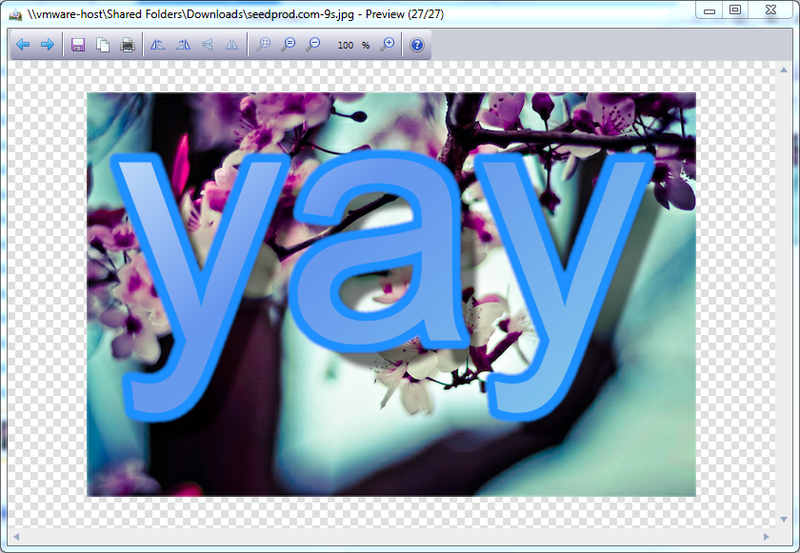 Most users do not know about Photoshop’s batch capabilities, but its image operation features can be used for multiple files in a batch too. 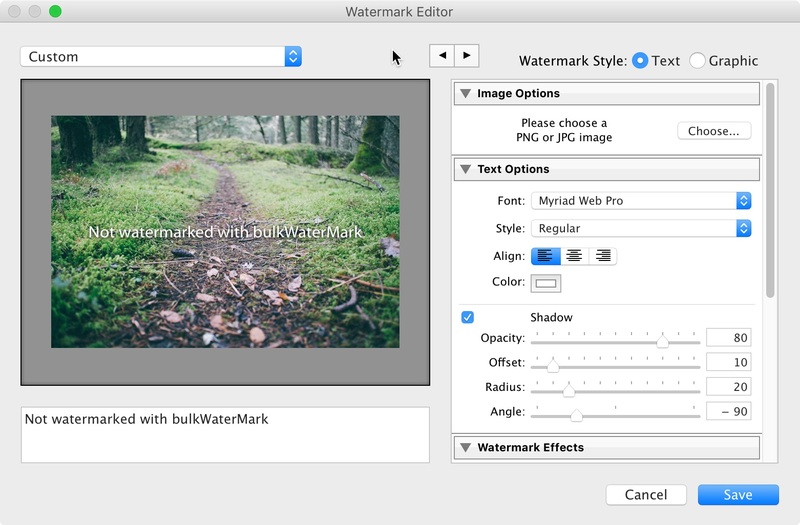 To get photos watermarked in a bulk operation, try out the following step-by-step guide. 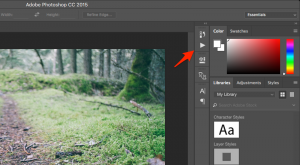 Note that our tutorial is done with Photoshop CC 2015 on a Mac, but shortcuts and user interface are nearly identical in Windows and the guide will also work for older versions. Photoshop has a nice feature called Actions. Most of you have probably used the Macro Recorder in Microsoft Office Products like Excel or Word to automate steps that you are doing often in your spreadsheets and documents. 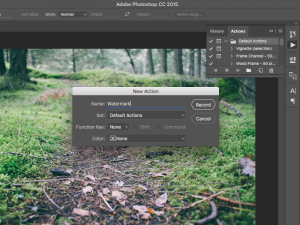 Actions are the counterpart of Macros in Photoshop to automate your image processing tasks. We will record now such an action to batch watermark photos. 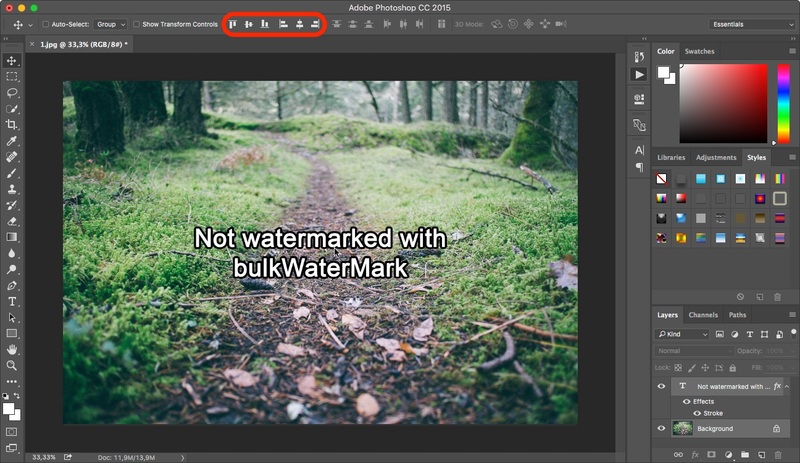 For creating your Watermark Action in Photoshop (or profile as we call it in bulkWaterMark), I suggest to load one of the pictures you would like to watermark into Photoshop. 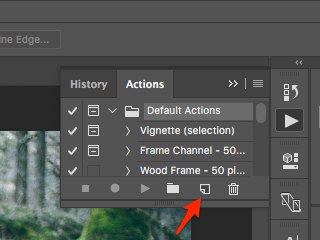 Afterwards, click on the Actions button in the vertical toolbar on the right side of your Photoshop window. By default, this button is not displayed. To display the button, open the menu item Window and click the entry Actions. Now it’s getting exciting: Photoshop is from now on recording all your actions. But do not panic, you do not have to hurry. It’s time to get creative now and design your watermark. To keep it simple and stupid, I’m using the Horizontal Type Tool of Photoshop to insert a text watermark by clicking anywhere on the picture. The glorious text my watermark is displaying is “Not watermarked with bulkWaterMark”. To make the looks of my text watermark more interesting, I’m using some of Photoshops layer blending effects, similar to the layer effects that bulkWaterMark features. You can access them by right clicking on the text watermark layer and select the menu item Blending Options. I’m adding a stroke blending effect to make my watermark appear stronger. You can try out the various effects to find a style that suits best for your watermark. 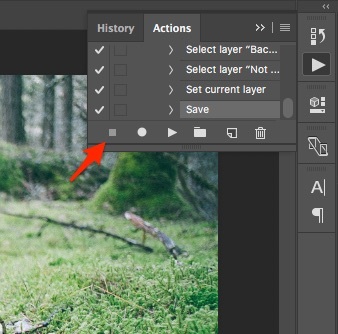 Photoshop also brings some default styles for layers that can be activated in the Styles tab (to enabled click the Styles entry in the Window menu). And the final tweak for our watermark: Transparency. 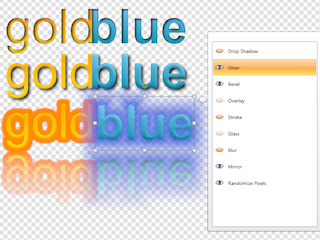 To change the alpha value of the text layer, just select the layer and set the value as you like. 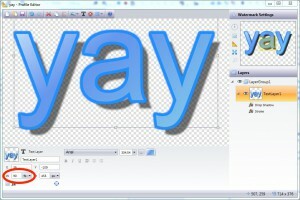 Now you have recorded the creation and styling of the text layer as an Action. The last step that needs to be recorded is saving the image. Use the File menu and click its entry Save As to save the image under any name and file format like JPEG or PNG for example. It’s a wrap! Time to replay what we have recorded: Let’s batch watermark our photos! The File menu’s Automate/Batch menu entry leads us to a new dialog that lets you select an Action to replay for our batch job. 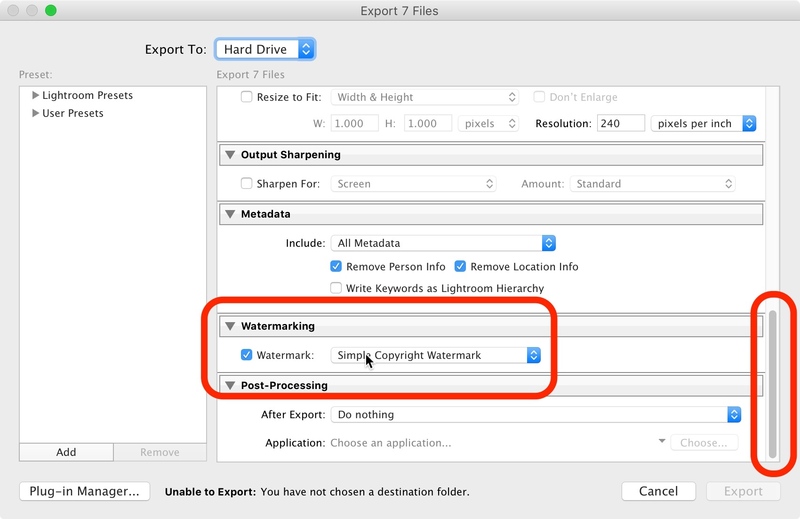 Step 10: Define your files and watermark ’em! 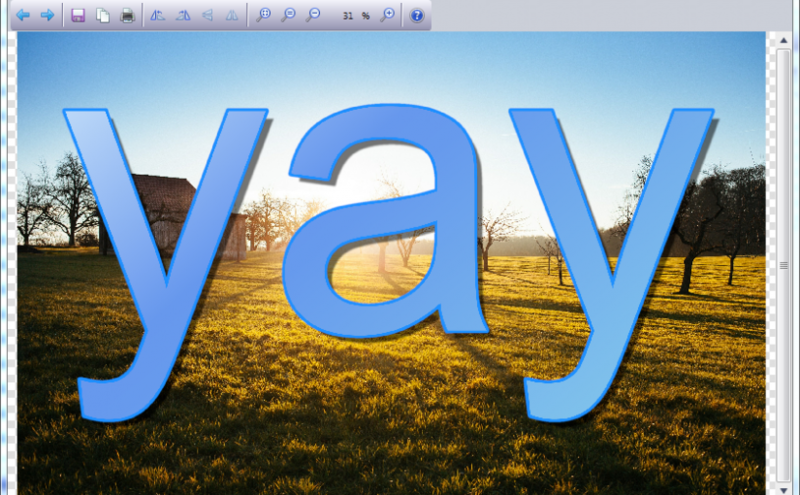 In the Play section of the dialog, Photoshop automatically selects our new Watermark Action. In the Source section, select Folder as batch source and choose the folder where your images you like to watermark are located. 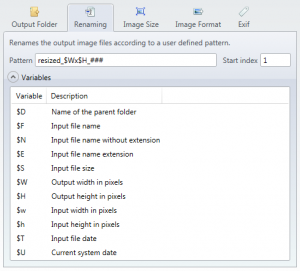 In the File Naming section you can define the naming of the output files. By default, Photoshop uses the original input image’s name and the extension of your output format. We cannot deny that Photoshop is a kind of a blueprint for some features of bulkWaterMark. Photoshop is powerful and can be used for anything concerning image processing. But what does bulkWaterMark better? When trying out the Photoshop Action, you will realize that running batch operations with Photoshop is not that fast. If you are working with thousands of photos, bulkWaterMark will protect your images much faster than Photoshop, since Photoshop replays the individual steps of an Action for every single picture. You will see every recorded step over and over again for each image. All layers and effects get recreated and re-rendered, while bulkWaterMark does this initially or only when it is necessary. Also, bulkWaterMark supports auto-scaling of watermarks that are too big for your photos. Furthermore, it automatically adjusts the size of a watermark proportionally, so that you can use a text layer as watermark that is 10 percent of the input photo’s width for example. 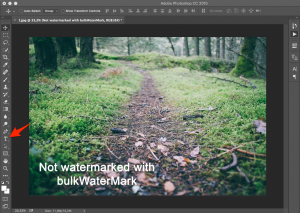 While Photoshop can do any image processing purposes in general, bulkWaterMark brings a lot of features that are really important to batch watermark photos that Photoshop does not offer. 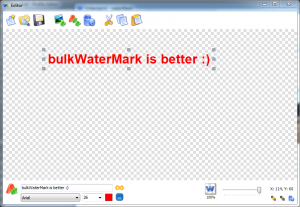 bulkWaterMark’s expressions are a unique and functional addition that allow scriptable content for text layers like displaying Exif metadata for example. Also the batch image resizing and renaming features are more versatile and tailor-made for batch watermarking. Hope you liked my tutorial!